» No April Fool Joke. Microsoft Geek Blogger, Robert Scoble, has resigned from Microsoft to join Silicon Valley startup PodTech.net as a videoblogger. I guess Niall Kennedy will take up Scoble's job. » John Dvorak, PC Magazine contributing editor, has admitted on camera that he deliberately pisses Mac users to get traffic on his site. Was this video interview by Dave Winer another attempt to build site traffic ? Only John knows. » Rocketboom, the world's most popular video podcast, has announced a partnership with BoingBoing which is the world's most visited blog. Amanda Congdon and Andrew Baron will do a vlog for BoingBoing which is expected to debut in few weeks time. 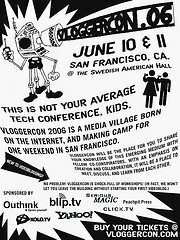 » Kevin Burton, co-Founder of Rojo, makes a wonderful observation - the female to male ratio at vloggercon is much higher than at other technology conferences. 20% of the vloggger audience is female. Call them equal opportunity bloggers. » Scoble informs that Cali Lewis of Geek Brief TV has quit her day job to do videoblogging full time. Also, Amanda's show is generating $85,000 per week in advertising. That's even more than what PlentyFish owner Markcus is making from Adsense. » Daily content is a big factor for RocketBoom success. They knew from the start that once-per-week program would take longer to get traction. With a daily show, you can more easily become part of your audience's routine. They sometimes work for 24 hours a day to produce that 3 minute daily video show. Are they consuming Modafinil pills ?